(Reuters) - The rusty patched bumble bee became the first wild bee in the continental United States to gain federal protection on Tuesday when it was added to the government's list of endangered and threatened species. The bee, once widely found in the upper Midwest and Northeastern United States, was listed after U.S. President Donald Trump's administration lifted a hold it had placed on a plan for federal protections proposed last fall by the administration of former President Barack Obama. Bumble bees are key pollinators of crops such as blueberries and cranberries, and are almost the only insect pollinator of tomatoes in the United States, according to the U.S. Fish and Wildlife Service. Conservation groups that had called for the new classification welcomed the move. "The listing helps mediate threats for this species and for all of those other animals out on the landscape that are suffering similar setbacks," Rich Hatfield, senior biologist at the Xerces Society for Invertebrate Conservation, said by phone on Tuesday. 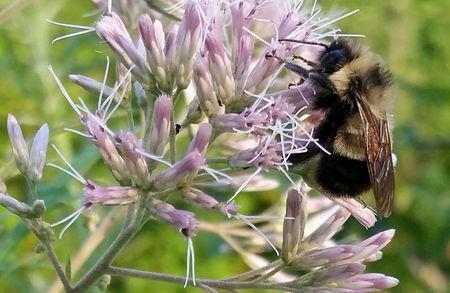 The rusty patched bumble bee, or Bombus affinis, is one of 47 varieties of native bumble bees in the United States and Canada, more than a quarter of which face risk of extinction, according to the International Union for the Conservation of Nature. The population and range of the bee, named for the reddish blotch on its abdomen, have declined by more than 90 percent since the late 1990s due to disease, pesticides, climate change and habitat loss, according to wildlife officials. The agency in September proposed safeguarding the bee, but the listing was delayed by Trump's White House as part of a broader freeze on rules issued by the prior administration. Environmental advocacy group the Natural Resources Defense Council sued last month, arguing that suspending the listing without public notice or comment violated the law. The NRDC said on Tuesday it was evaluating the next steps in its legal fight. Government scientists said the delay, part of a standard review, was not expected to affect the insect's conservation, Interior Department spokeswoman Heather Swift said in a statement on Tuesday. The agency "will work with stakeholders to ensure collaborative conservation among landowners, farmers, industry, and developers in the areas where the species is native," she added. Bumble bees pollinate wildflowers and about a third of U.S. crops, according to the Xerces Society. A recent study by the Center for Biological Diversity found that more than 700 of the 4,000 bee species native to North America and Hawaii may be inching toward extinction.